Once known as the Zenrinji Temple, Eikan-do Zenrin-ji is a Buddhist temple of the Japanese Jodo sect. 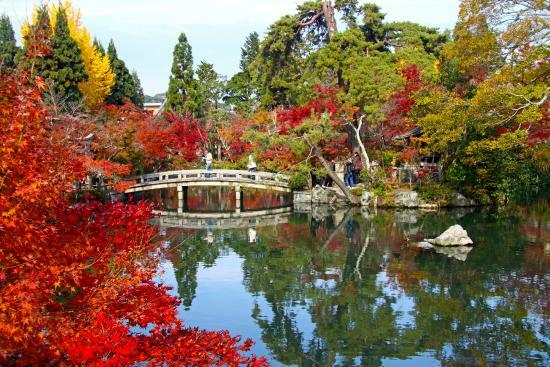 Enjoying a location that is close to the Nanzenji temple complex, this temple is perhaps best known for its gorgeous Fall colors during the second half of November, as well as the beautiful illuminations which are held during Fall evenings. This structure has its origins in the Heian Period when a court noble donated his home to a priest. It was then converted into a temple with a name that translated as “temple in a calm grove”. The main buildings have been built along the base of the hills and have wooden corridors connecting them. The Shakado is the first building that can be explored, and features its own small rock garden together with stunning painted sliding doors. Visitors can also visit the Amidado in which they can see the famous side-facing Amida statue – the temple’s main object of worship, and can see the 2 storey Tahoto Pagoda from which there is a spectacular panoramic over over the city. Tourists should also not miss the Hojo Pond and its surrounding garden, as there is a small shrine on the island at is center.